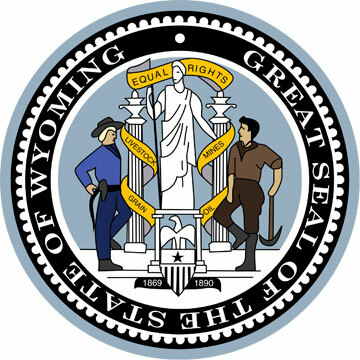 State seal of Wyoming; public domain image on Wikipedia. There are two dates on the seal: 1869 commemorates the organization of the Territorial government and 1890 is the year Wyoming was admitted to the Union (the Roman numerals for the number 44 on the five-pointed star signifies that Wyoming was the 44th state admitted to the Union). 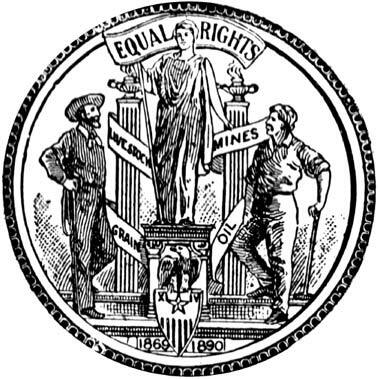 The draped Liberty-style figure in the center holds a staff from which a banner flows bearing the words "Equal Rights" (a symbol of the equal political status women have always enjoyed in Wyoming). The two male figures represent the livestock and mining industries of the state. The lamps burning on top of the pillars are a symbol for the Light of Knowledge. The scrolls wrapping the two pillars bear the words "Oil, Mines, Livestock, and Grain" (four of Wyoming's major industries). 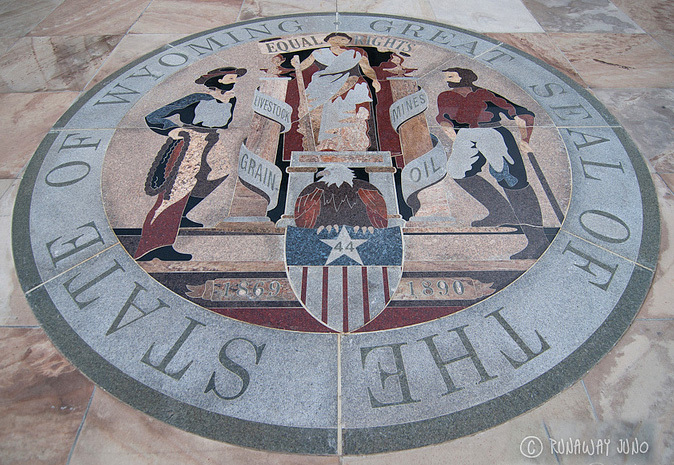 Great seal of Wyoming at the capitol in Cheyenne, Wyoming photo by RunawayJuno on Flickr (noncommercial use permitted with attribution / no derivative works). State seal image courtesy of ClipArt ETC - Florida Center for Instructional Technology (see license for use). See All State Seals - National Seal.